Hello all, Alison here... Very happy to be back at eclectic Paperie to share another project with you. 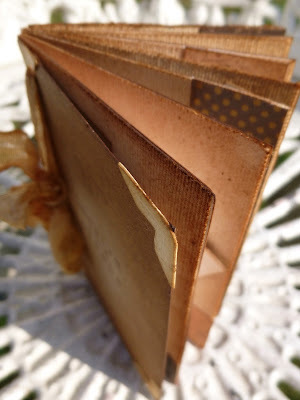 This one is a very simple little ATC book (I seem to have a thing about handmade books), with lots of little pockets - brilliant for using up paper scraps when you really want to make the most of every last little bit of your favourite papers! It's a tiny book of uplifting and thought-provoking words and phrases, so that you can turn to it for a little bit of inspiration when in need. And of course you can add more phrases, or other memorabilia, pictures and ephemera as time goes on... plenty of room in those pockets. I started with six of the Inkssentials natural canvas ATCs. 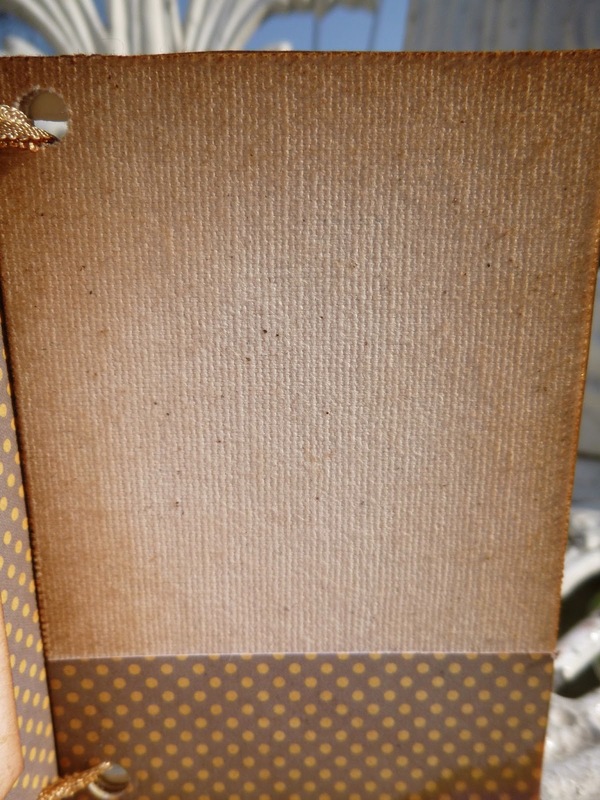 One of the great things about these is that they are sticky-backed, so you get all the great canvas texture and you can apply it really easily to cardstock or chipboard to create a really sturdy, dimensional ATC. I adhered my six ATCs to some kraft cardstock, and then started juggling with my papers. These are from the Basic Grey Serenade set. I worked out I had enough to do a couple of ATC-sized pages and a couple of "pockets" out of each of my selected papers. I wanted to leave plenty of the canvas on display, and also to keep things pretty minimalist, so I kept my pockets nice and simple: a plain rectangle, alternating (mostly) between vertical and horizontal positioning. And I gave the canvas a good going over with the Vintage Photo Distress Ink to really highlight all that lovely texture. I thought about doing some stamping on the canvas, which I always love the look of, but I was quite enjoying the clean lines of the whole thing (couldn't bear to leave out the distressing though!)... it's probably the nearest I'll ever get to a CAS project! All the sentiments - from the fabulous Donna Downey sets, Empowered Words and Art and Possibility - are also stamped onto paper scraps, so they look pretty cute either way up, and they've also had a touch of the Vintage Photo DI of course. 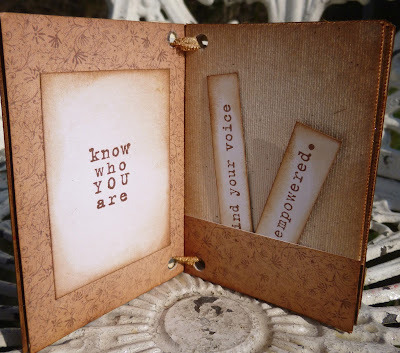 On each facing page, the design paper side, I've added one of the larger sentiments, stamped on plain white cardstock and inked to tone in with the rest of the look. I particularly love this Picasso quote... and I've tried to match the quotes in the pockets with my "main" quotes each time - I've tried to create satisfying groupings that "speak" to each other. Finally I added the little corner pieces cut with the ATC and Corners die by Tim Holtz onto the front and back covers. I love the "finished" look it gives. 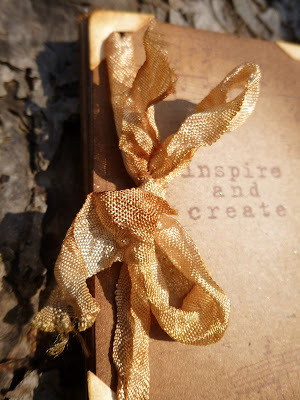 The binding is incredibly simple too (seriously, you can knock up a whole little album in well under an hour) - just some crinkle ribbon dyed with Vintage Photo Distress Stain, and tied through the punched holes to give a pretty bow at the front. I had to do a little bit of retying to get the tension right, so that the pages would turn easily without the whole thing flopping about uncontrollably, but that was about the hardest thing in the whole project - and, really, what's so hard about tying a bow a couple of times!? 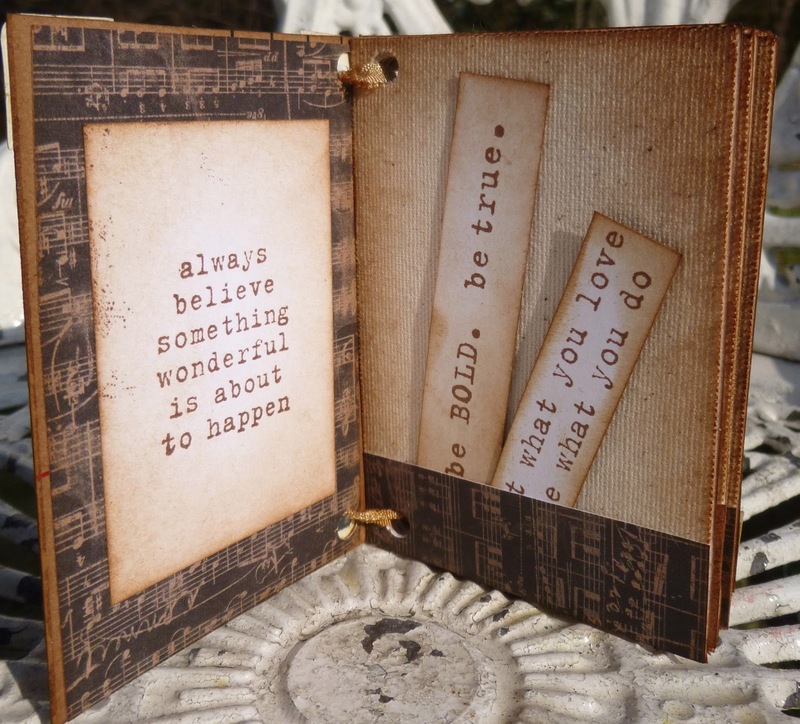 Awesome atc book! Love the concept and vintage feel! Wonderful little book - you have chosen the perfect papers to go with the vintaged sticky back canvas. Stunning ATC album Alison. Inspiring words. Inspiring words Alison and a very inspirational project. 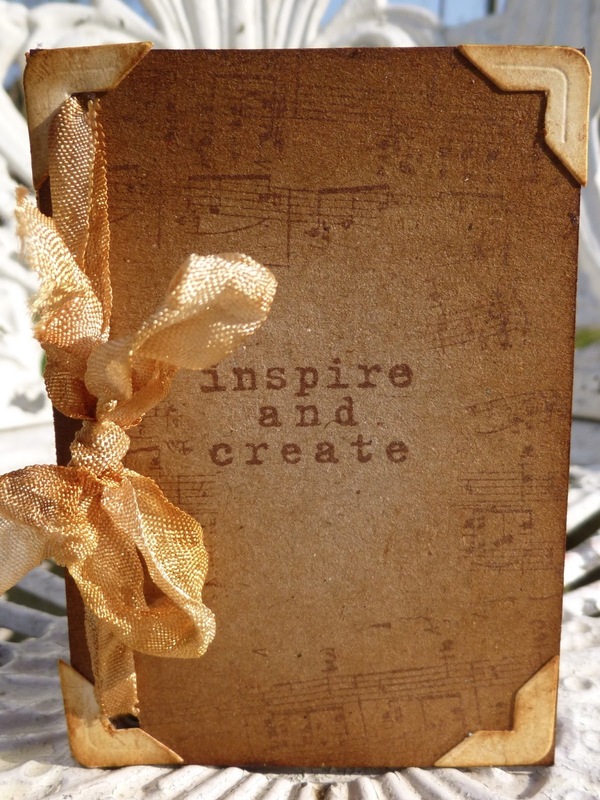 Love your ATC book what a great idea ... hum ... great gift ! Great idea and I love the simplicity of it! Wow this is so beautiful. Thanks for the very inspirational tutorial. I really want to give this a try. Precious, Alison! I'm a huge fan of mini books and ATCs so this is right up my alley! Love this! What a gorgeous mini book. 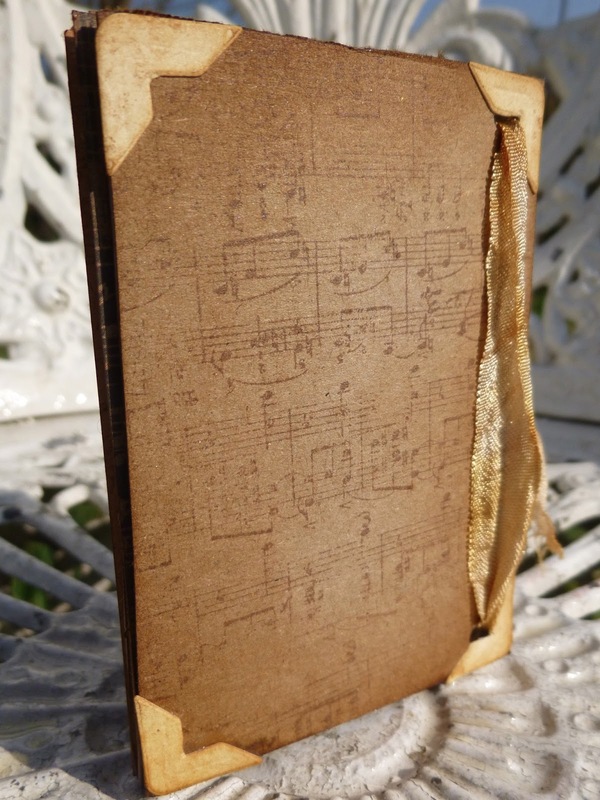 I love the vintage look and each page is totally wonderful! Fabulous Alison! Just as I thought, AMAZING! Love this mini ATC book, so cool and stunning! Hugs! Sometimes less is more...this is one of those times. Love it!! This is absolutely beautiful album! Zelf zou ik het niet kunnen. a wonderful idea- thankyou.The words are inspirering and beautiful. A wonderful book and such a fantastic idea too. What a beautiful little book, Alison. The combination of the canvas with those lovely papers works so well and provides a fabulous background for the quotes. I really like the way you have combined the various sayings to maximize their impact. Beautiful journal. I love all the inspiration both in the words but in the overall look of the journal. Thanks for sharing this great idea. Time to go create myself one of those. What a lovely little book of inspiration. Good for the bedside when you wake up in the morning. 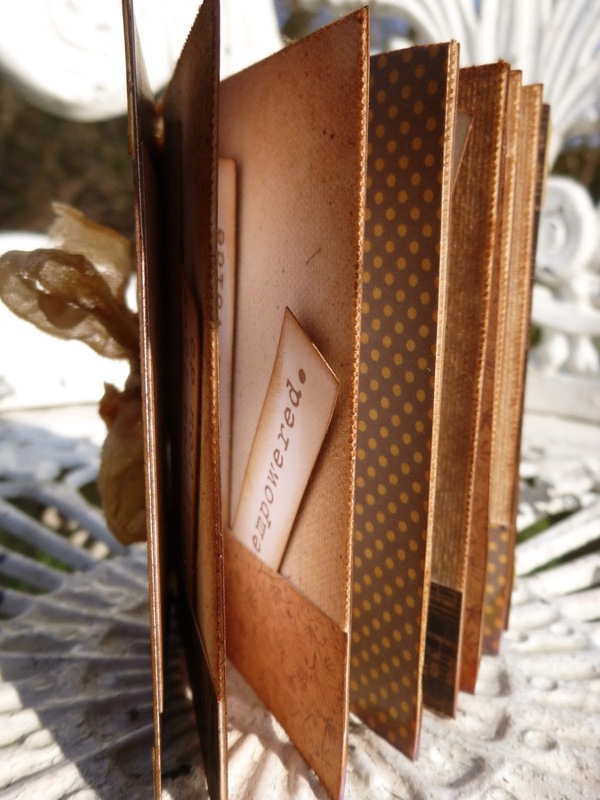 Adore mini books Alison and yours is truly beautiful and inspirational!!! Great idea. I will have to give this a try. I especially like that it does not involve photos. I LOVE the simplicity of the cover. Clean yet oh so dirty!!! This is beautiful! This is gorgeous Alison. Very inspirational wording on this. This is absolutely wonderful, Alison! You always find the best quotes and you have displayed them beautifully! Gorgeous book!